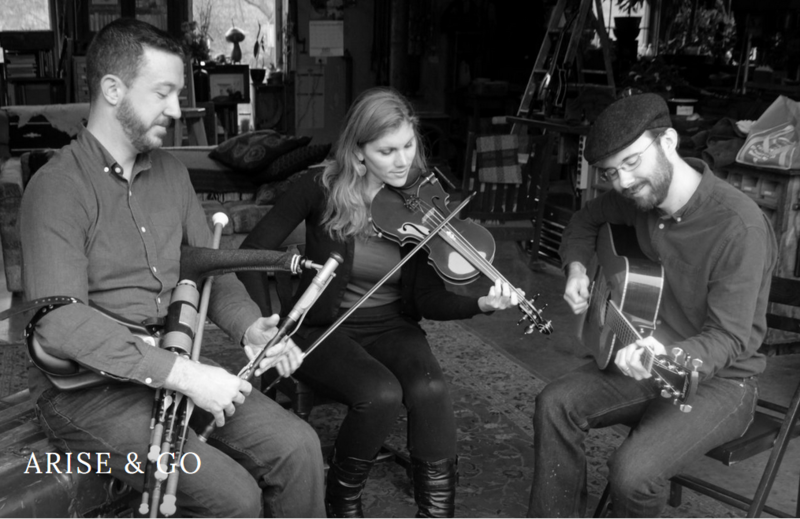 Arise & Go is an exciting Celtic trio that finds its roots in the dance music of Ireland, Scotland and Atlantic Canada. Blending pipes, whistles, fiddle, and guitar, the group’s varied musical backgrounds combine to produce a sound which is both grounded in tradition and uniquely fresh and driving. Performance (7:30 pm): $20 general admission, $15 for Comhaltas members, $15 for students, under age 16 free. Legendary Irish accordion champion John Whelan teams up with the American Roots band Low Lily and Scottish-style fiddler Katie McNally for a spectacular St. Pat’s Celebration! Exploring the Roots music of Ireland, Scotland, and America, this diverse and energetic show will showcase fiery uptempo jigs and reels alongside lushly arranged songs, featuring two fiddles, accordion, guitars, mandolin, and harmonious vocals. Performance (7 pm): $20 general admission, $15 for Comhaltas members, $15 for students, under age 16 free. And then, adds Abarta, there were the tunes that “just follow you around.” One was “Cucanandy,” an example of a dandling song – a sort of anti-lullaby, made for entertaining children rather than lulling them to sleep – famously recorded by Elizabeth Cronin as part of a collection by Seamus Ennis in the 1940s. It’s included on the album as part of a medley of hop jigs. Contact marta.driscoll@gmail.com to register for workshops. Open the Door for Three is a trio that plays its Irish music powerfully. They mine tune books, collections, and recordings for old and new tunes and songs. They add to those discoveries fiddler Liz Knowles’s compositions, harmonies, and arrangements, Kieran O’Hare’s encyclopedic knowledge of tunes and the uilleann piping tradition, and the rhythmic bedrock bouzouki and world-class singing of Dublin-born Pat Broaders. The trio's members are veterans and mainstays of the Irish music scene around the world, having played with Riverdance, Cherish the Ladies, Secret Garden, Anúna, Liz Carroll, and The New York Pops, as well as with artists like Don Henley, Paula Cole, Bonnie Raitt, and Josh Groban. They have performed around the world: on Broadway, at Carnegie Hall and the Kennedy Center, at L'Olympia and the Palais des Congrès in Paris, in Malaysian rainforest festivals, in theatres from Shanghai to São Paulo, and even a bullring in Mallorca. Their debut release ‘Open the Door for Three’ followed by ‘The Penny Wager’ and now their brand new third CD ‘The Joyful Hour’ are the culmination of years on the road, comprised of unearthed tunes, new arrangements of great songs, homages to the musicians and bands they grew up listening to, and the signature sound of a trio of good friends playing great music together. Concert Admission: $20 adults, $15 CCÉ Members, $10 students. Free for kids under 16! Admission: $20 adults, $15 CCÉ Members, $10 students.